Powerful and refreshing, Clorox® Fraganzia® Toilet Bowl Cleaner leaves behind nothing but the long-lasting fragrance of spring flowers. A small amount into the toilet bowl and under toilet rim. The bowl with a stiff brush. Want to find other ways to use Clorox® Fraganzia® Toilet Bowl Cleaner? Does Clorox® Fraganzia® Toilet Bowl Cleaner have bleach? 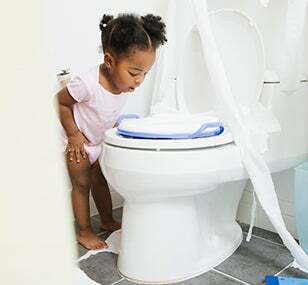 Can I safely use Clorox® Fraganzia® Toilet Bowl Cleaner around children and pregnant women? Can I safely use Clorox® Fraganzia® Toilet Bowl Cleaner around pets? What is the shelf life of Clorox® Fraganzia® Toilet Bowl Cleaner? The shelf life of Clorox® Fraganzia® Toilet Bowl Cleaner is one year. Is Clorox® Fraganzia® Toilet Bowl Cleaner safe for septic systems? Yes. The recommended use of Clorox® Fraganzia® Toilet Bowl Cleaner will not harm your septic system. Does Clorox® Fraganzia® Toilet Bowl Cleaner disinfect? Clorox® Fraganzia® Toilet Bowl Cleaner is not registered as a disinfectant. Where can I buy Clorox® Fraganzia® Toilet Bowl Cleaner? You can find stores near you that sell Clorox® Fraganzia® Toilet Bowl Cleaner on our Where to Buy page. It's a good idea to call the store before going, to make sure they have it in stock. If you have any trouble finding it at a nearby store, you can also buy it online. Where can I get coupons for Clorox® Fraganzia® Toilet Bowl Cleaner? Check the Coupons page to see if there are coupons available for Clorox® Fraganzia® Toilet Bowl Cleaner. And sign up for the Clorox® newsletter to find out about new coupons via e-mail. Rated 2 out of 5 by Pammie1212 from Fresh scent toilet bowl cleaner Works pretty good and the fragrance is nice, but it left my toilet bowl BLUE!! I can't removed the blue color in the bowl.